Bear, my cat, has been behaving a little weird lately. I think the crap weather here in Oregon is getting to her, because it's darker than California and the wet weather means she's indoors more often. Bear usually would hang out in a kitty bed behind the TV, or in one of my dresser drawers. But this week, she's taken to hanging in the tool closet, up on the towel rack over the commode and, all of today, in front of my keyboard. It's like trying to type around a furry meatloaf. 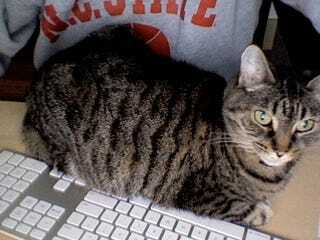 So if there were any typos, misspellings, errors or libel this week, blame the cat.